made glorious by these shoes of Yellow. Well, if not glorious, then at least comfortable. Northwave has long offered competent winter cycling shoes, perhaps because the Italian company also has a successful line of snowboard products including boots. Of course, in the cycling world Northwave first made its reputation with completely over-the-top print ads featuring the stars of professional cycling in outlandish vignettes, like Mario Cipollini dressed as a musketeer and holding a naked blonde. Though I have known all that for years, I have never before owned Northwave shoes until now. 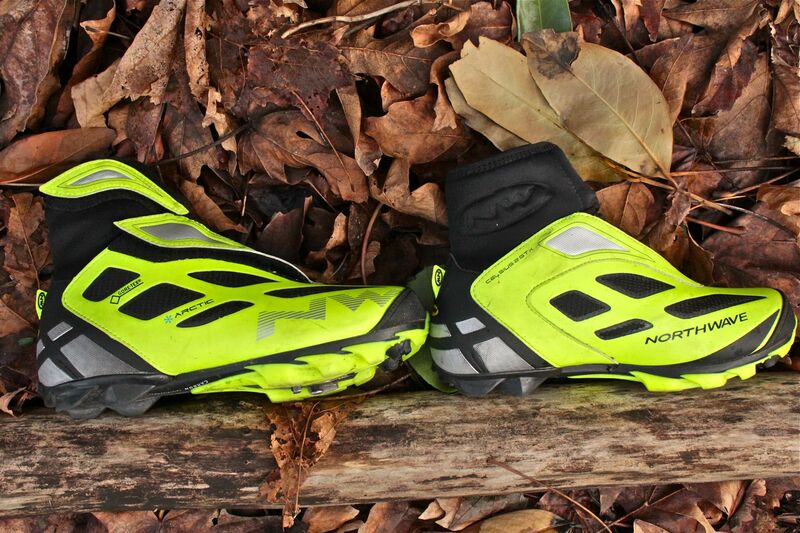 Northwave now actually makes three different levels of winter shoe, and each level in either road and mtb soles. The newest versions incorporate the thermal welded uppers that are carried over from Northwave’s regular cycling shoes. Though not imported into the US, the current entry-level Celsius 2 GTX (mtb) and Fahrenheit 2 GTX (road) both use the Gore-Tex Pique membrane, while the Arctic GTX versions use the Gore-Tex Koala membrane. The suggested temperature range for the Arctic versions is -25 to +5deg C (-13 to +41deg F). 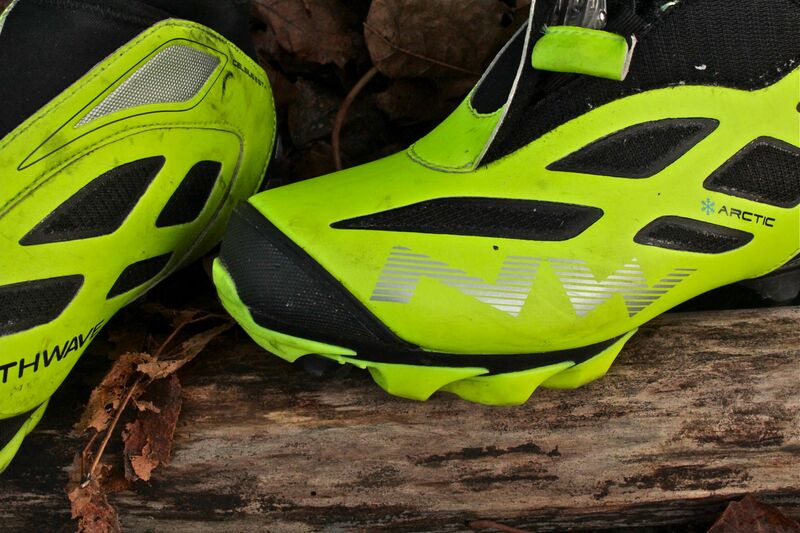 The top-of-the-line winter shoes from Northwave are the Extreme Winter GTX-M ($299, mtb) and GTX-R ($319, road). Though these models use a different Gore-Tex than the Arctic, I’m not sure if the shoes are designed for colder environments than the Artic shoes. In the Northwave lexicon, “Extreme” designates a flagship model rather than extreme weather. What makes it a flagship model is the dual twist-ratchet fasteners. 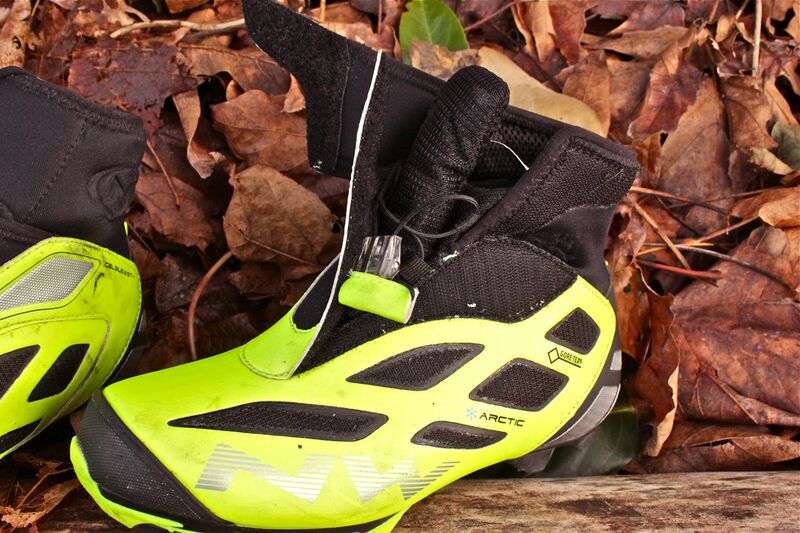 I chose to test the Celsius Artic 2 GTX shoe rather than the road shoe since I can count on using mtb pedals on my commute to work at least 5-6 times a week, whether or not I am motivated to train outdoors on my a bike with road pedals. And this shoe is great for commuting. Rather than clumsily adding booties to regular shoes, I can just pull on the Celsius Arctic 2 shoes, snug up the speed laces, and go. Cycling during the wet Pacific NW winters is already such a hassle that one appreciates anything that reduces the rituals of dressing for the weather. The neoprene & velcro cuffs secure interior storm flaps, and the rest of the shoe’s upper is protected by the Gore-Tex Koala membrane. The first chance I got, I put my foot into an ankle deep puddle, and I was impressed that my foot was still dry after 20 seconds of immersion. Depending on the air temperature, the shoe can feel a little moist after a while of hard riding, but overall I feel like the Arctic 2 GTX is almost perfect in the 30-45deg F range with regular weight cycling socks. You’d definitely want warm socks if below 30deg F though, and there is no way that I would consider this shoe suited to -13deg F. If you already own Northwave standard cycling shoes, you may need to size up to wear thicker socks since their winter shoes have about the same internal volume as the rest of their shoes. Actually for me, I find that the interior volume of Northwave shoes to be almost too much for my foot. The Celsius Arctic 2 GTX fits almost loose on me even when I have the speed laces draw all the way tight. I had to replace the stock insole with something a little thicker, though that did give an appreciated increase in arch support. 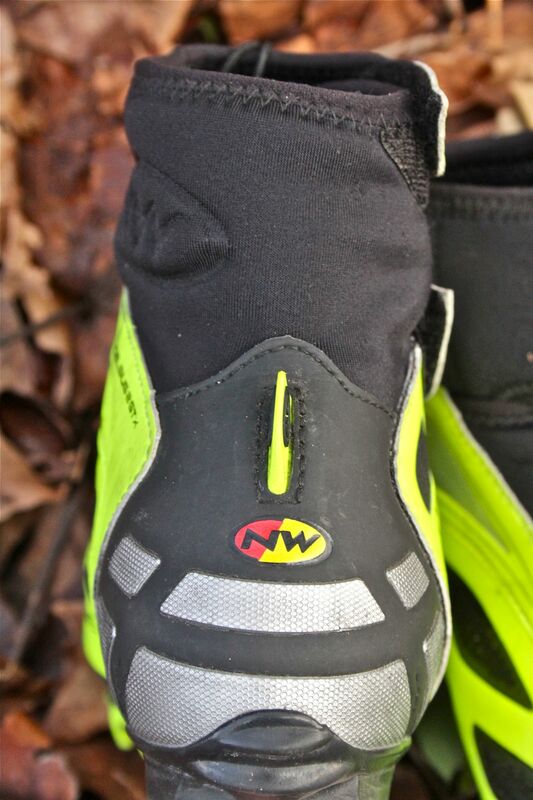 I don’t consider these observations to be a complaint against Northwave so much as issues related to my foot shape. I wear a size 39.0 in Sidi and Giro shoes, and without a doubt 39.0 Northwave fitsbigger though not really longer. I generally like my shoes to fit snug and stiff, but maybe that’s not even possible with a high-top cycling shoe that still allows sufficient range of motion. A performance winter shoe needs to offer some support to one’s foot; otherwise it ends up being feeling like an UGG boot with a cleat attached, but if the whole shoe is both tall and stiff then one’s pedal stroke will be hampered. 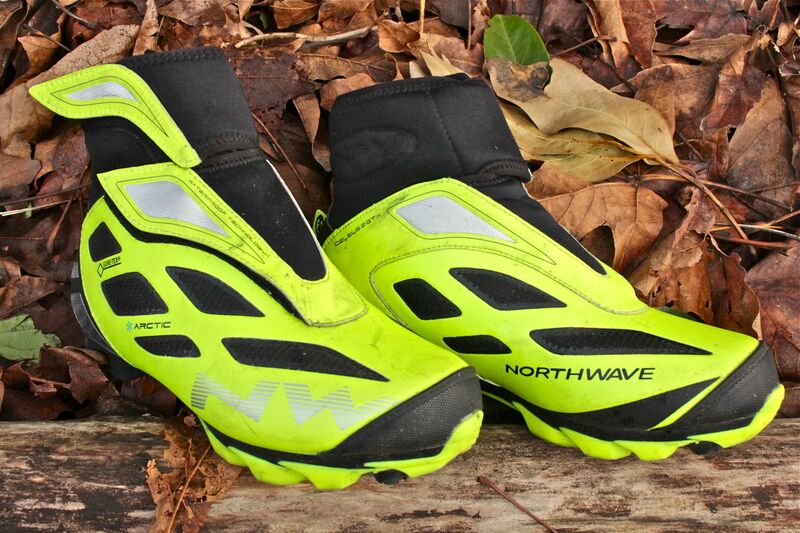 These Northwave winter shoes strike a decent balance between support and flexibility for near freezing temperatures. But despite the name of these shoes, the Northwave is not for arctic cold. If your winter riding is more about fatbiking in the snow all day than laying down base mileage before road season, then you should be looking at something from 45North. Such shoes are however much bulkier and massive. If you consider combating water rather temperature, the achilles heel of any water-resistant cycling shoe is that there must be at least one large and difficult to seal hole: the hole into which your foot fits. 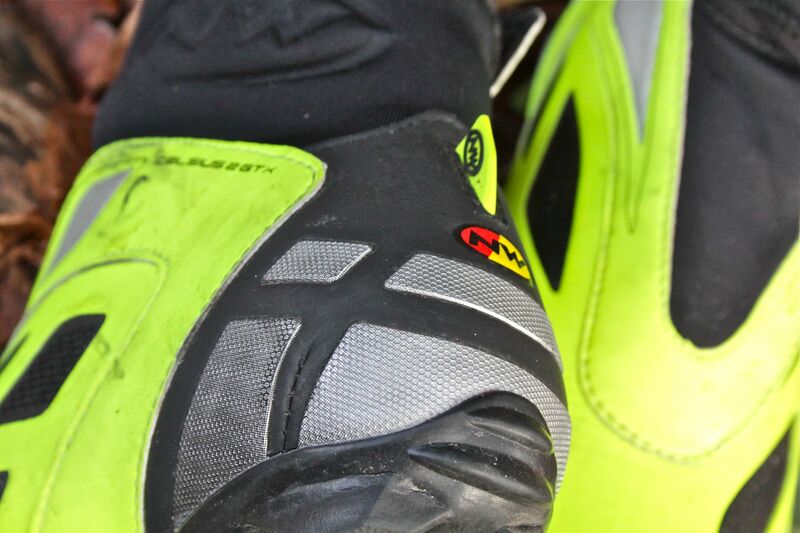 The Northwave shoes have a well-shaped, supple neoprene ankle cuff that fits far better than the one on Sidi winter shoes, but in a downpour, the water will eventually wick into the shoe if your socks get wet. Or maybe it’s not a downpour but lots of deep puddles splashed by your front wheel. For commuters, this can be solved if you have rain pants that can overlap the top of the shoe and perhaps a full-coverage front fender. For rainy road training, maybe a rain booty over a regular shoe might be a better choice. 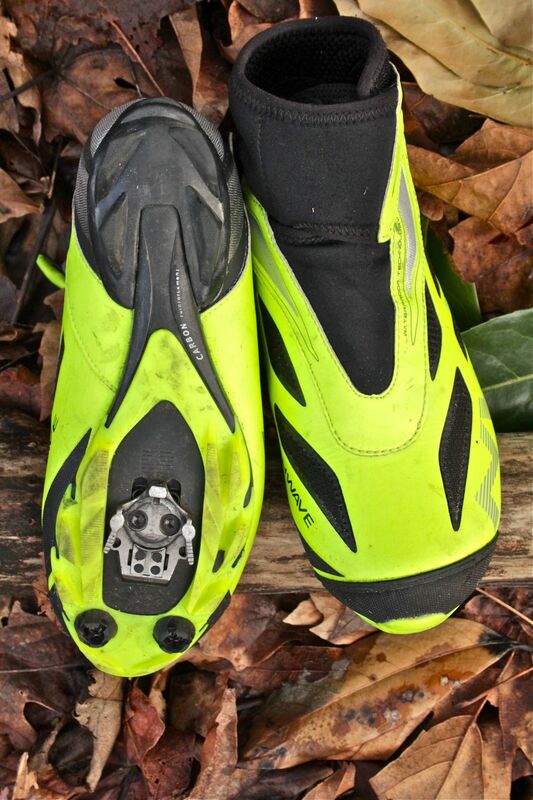 If you actually plan to use the Celsius shoe for offroad biking where you might have to portage your bike through water, there probably is no setup that will keep you dry and warm while still giving the performance of a racing shoe. 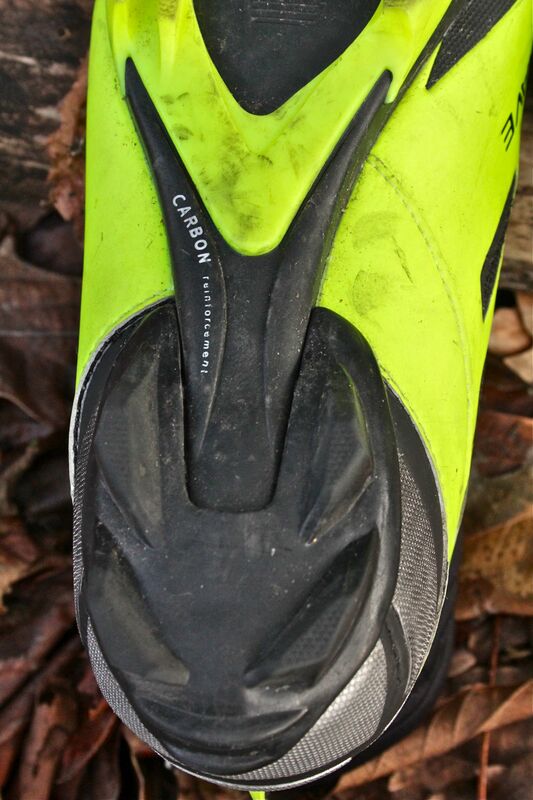 The Celsius’ carbon-reinforced sole is reasonably stiff but not so much that it makes the upper seem flimsy by comparison; the shoe has a good balance both on and off the bike. The tread compound is just adequately grippy. I have definitely had shoes that could cope with cold, oily asphalt or linoleum floors better, but Northwave is far ahead of Sidi shoes, which will readily betray you on such surfaces. Overall I would recommend the Northwave Celsius Arctic 2 GTX to commuters and other winter riders so long as the temperature is not too far below 30deg F. They are a worthy investment at $229. I chose the visually offensive fluorescent yellow version, but it is also available in black with minute accents of blue.